Drivers are generating more than €25,000 a day in fines by ignoring a ban on daytime traffic on the Chaussée d'Ixelles, it has emerged. In an average day, 500 vehicles are caught by number-plate scanning cameras using the "semi-pedestrian" street, which since July is limited to bikes, buses, delivery vehicles and residents' access between 7.00 and 19.00. "Some days there are 320 offences, other days there are 700," said Bertrand de Buisseret, the Ixelles official in charge of traffic fines. "It fluctuates, but there are really a lot." De Buisseret insists that the road signs are clear. The municipality has organised a series of meetings with local residents and traders to assess how the traffic ban is going so far. Drivers who use the Chaussée d'Ixelles during the restricted hours face a fine of €58 - but there is an appeals procedure if a good reason can be given for flouting the ban. Residents and business-owners with a pass can still use the street. "The goal isn't to make money," added de Buisseret. "It's to ensure the area is more peaceful." I am sure the local businesses are thrilled that the area has been made more peaceful. Another great idea by Brussels Immobility. Perhaps they should close Avenue Louise to traffic to ensure peacefulness in the entire shopping district. That's more than €9,000,000 a year in traffic fines, I would say that is very delighted. All the time the governments allow more and more vehicles on the roads, against a hefty tax, of course! At the same time, more and more and more parking spaces, traffic lanes and even complete roads, now also city centres, are taken away from the motorist, who, of course, has to keep paying his road tax. Now the authorities are constantly trying to push that same motorist onto public transport and bikes etc. But the motorist still has to keep paying the road tax and, obviously, tax on the car when he buys it! Now plus bus fares, the purchase and maintenance of a bike etc. In the miles and miles of tailbacks, cars burn a lot more fuel, which allows the government(s), by now backed up by growing public support, to unashamedly blame the motorist for the increasing pollution, while levying a hefty tax on more and more fuel consumed, raking in a lot of tax on parts that wear out faster, aaand tax on the (garage) work to replace these worn-out parts. In Brussels, the main culprit for all this is bull-headed ministar Pascal Smet, an inveterate dogooder. As he himself proudly admits. Our own governments are systematically harassing and robbing the motorist! It's grab-what-you-can on the part of the governmentS alright. Well... all wrong, actually! I really don't get the unleavened aggro one sees so often against Smet. 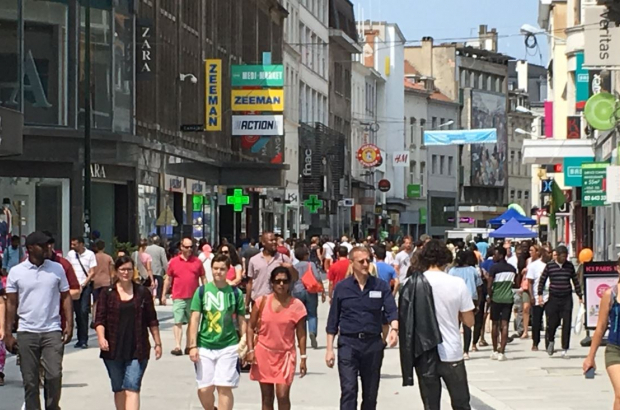 As anyone who has chosen to live in the city over the last 20+ years can testify, Brussels was desperate, literally gasping for someone finally to take on the palpable ruination of the city by excessive traffic, itself the consequence of decades of horribly misguided pro-car policies which have made entire quarters of the city uninhabitable. Blame the politicians who built the tunnels, the massive car parks, the urban motorways, the ones who gave tax breaks amounting to huge subsidies for private car use which massively outstrip the subsidies given now to other forms of transport and, I guess, the fines and taxes paid by motorists as well. The transition to something more sustainable and liveable will not be straightforward and will involve some mutual adaptation and tolerance from everyone. But the status quo is not an option. As for the Chaussée d'Ixelles, thank God we finally have something resembling a modern city environment (though frankly with much left to be desired). And what is this crazy idea that suffocating gridlock is good for the businesses that line the afflicted streets? Urban centres and commerces are being revived across the world by intelligent pedestrianisation. If a few drivers take a while to get used to not having the God-given right to impose their vehicles on everyone else whenever and wherever they like, it's not an excessive price to pay, surely? Whatever, Brussels is getting better. It really is. Awkwardly at times, with missteps for sure. But 'chapeau' to the politicians of all colours who have realised that something simply had to be done and are finally making the effort to turn things around.